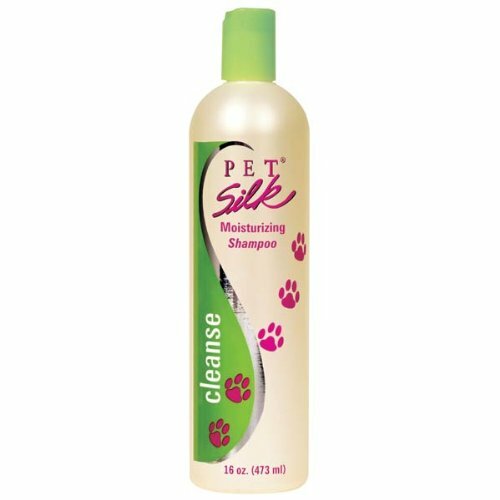 Pet silk moisturizing shampoo leaves coats clean, bright and silky with a blend of organic silk and amino acids. Herbal extracts, vitamins a, b, d and e, chamomile and rosemary help strengthen the coat. Pet silk moisturizing shampoo contains a blend of herbal extracts and silk to moisturize and condition as it cleanses. Leaves a shiny, fresh-smelling coat. Dilutes 16:1. 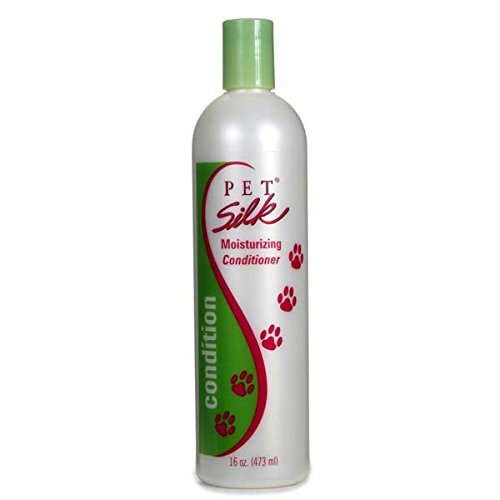 Pet silk moisturizing shampoo is available in the sizes listed below. Ingredients are silk extracts, aloe vera, jojoba, and vitamins a, d, b, e. Amino acids, rosemary, and chamomile. Directions for use - wet coat thoroughly. Apply generous amount of pet silk moisturizing shampoo and work into a luxurious lather. Rinse. Repeat for maximum results. Comes in a 16 ounce. Measures 9-1/3-inch length by 2-1/2-inch height by 2-1/2-inch width. BioSilk moisturizing shampoo gently cleanses and locks in moisture for a soft, shiny and healthy looking coat. PH Balanced for pets. Safe for use with topical flea and tick treatments. Free from sulphate and paraben. This moisturizing conditioner leaves coats clean, bright, and silky with a blend of organic silk and amino acids. Herbal extract, vitamins a, b, d and e, chamomile, and rosemary help strengthen and reconstruct dry, damaged coats to leave them healthy and full of shine. The conditioner helps detangle hair for easier comb-outs. Dilutes 16:1. It contains deionized water, dicetyldimenium chloride, wheat germ oil, aloe vera, honey, panthenol, silk amino acids, comfrey, chamomile, jojoba oil, rosemary, thyme, lavender, mint fragrance. Available in 16-ounce size. Ingredients are deionized water, dicetyldimenium chloride, wheat germ oil, aloe vera, honey, panthenol, silk amino acids, comfrey, chamomile, jojoba oil, rosemary, thyme, lavender, mint fragrance. Directions - after shampooing with pet silk moisturizing shampoo, apply a generous amount of pet silk moisturizing conditioner, massage through and leave on for 5 minutes. Rinse thoroughly and repeat if desired. For best results, finish with pet silk finishing products. Measures 9-1/3-inch length by 2-1/2-inch width by 2-1/2-inch height. Pet silk's rain forest shampoo deeply cleanses the coat and adds a brilliant shine, while leaving a long-lasting, refreshing, leafy, and lightly floral scent. 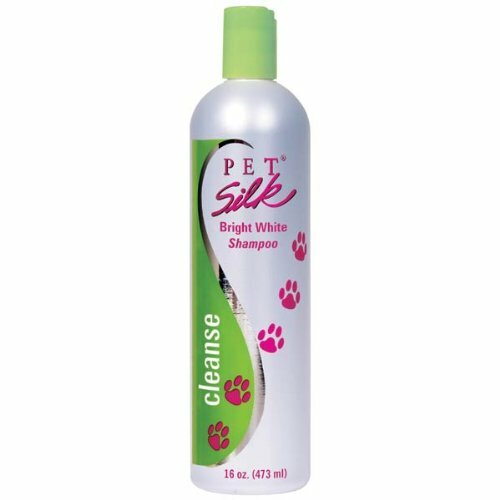 Pet silk bright white shampoo adds shine and color to dull coats as it conditions with all natural silk. Herbal extracts and organic silks add color without harsh dyes. Use every time you bathe dog for deeper shine and richer color. Ideal for use on white, silver, or light coats. Organically brightens, cleanses, conditions, moisturizes, and shines. Gentle formula is environmentally safe. Pet silk can used on both dogs and cats. Dilutes 16:1. Comes in a 16 ounce. Ingredients are deionized water, tea lauryl sulfate, sodium laureth sulfate, mint extract, fennel extract, mistletoe extract, yarrow extract, silk proteins, keratin, amino acids, betaine, cocamide mea, chamomile extract, rosemary, comfrey, vitamin a, vitamin b, vitamin e, vitamin d, and fragrance. Directions for use - wet coat thoroughly. Apply generous amount of pet silk bright white shampoo and work into a luxurious lather. Rinse. Measures 9-1/2-inch length by 2-1/2-inch height by 2-1/2-inch width. "BioSilk Therapy for Dogs Whitening Shampoo features the same classic ingredients and innovative technology as the original and revolutionary BioSilk Silk Therapy line for humans. Luxuriously formulated with silk and enriching vitamins that work together to restore the moisture balance to your puppy’s coat. BioSilk for Dogs Whitening Shampoo gently deep cleans while it brightens white or lighter colored coats. Natural silk botanicals leave the coat soft and shiny while helping maintain coat color and brightness. All BioSilk Dog products are pH balanced for dogs making it the perfect bath time solution for your fur baby. 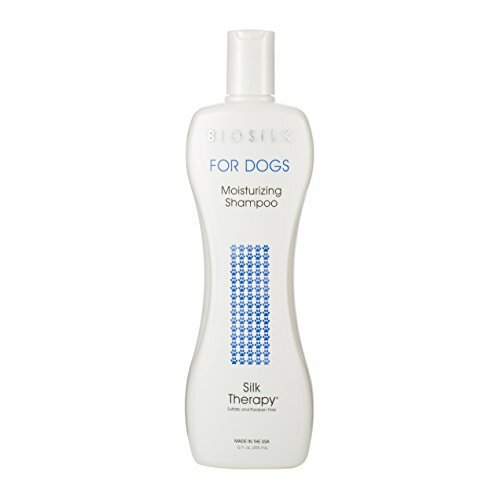 Get your BioSilk Therapy for Dogs Whitening Shampoo and your puppy will be clean, soft, and bright white. Directions: Using warm water, wet coat thoroughly. Apply shampoo from back of ears to tail, carefully avoiding eyes. Lather and gently massage deep into coat and skin. Rinse well. Repeat as needed. For external use only. Safe for dogs 8 weeks of age or older. Keep out of reach of children or pets. Ingredients: Water, Natural Cleansing Agents, Hawaiian White Ginger, Papaya Leaf Extract, Lemon Extract, Silk Protein, Soy Protein, Panthenol, Fragrance." Looking for more Silk Dog Shampoo similar ideas? Try to explore these searches: Teal Cummerbund, Tecumseh Oil, and Bling Fashion Watch. Shopwion.com is the smartest way for comparison shopping: compare prices from most trusted leading online stores for best Silk Dog Shampoo, Halloween Mardi Gras Masks, Logo Woven Necktie, Silk Shampoo Dog . Don't miss this Silk Dog Shampoo today, April 19, 2019 deals, updated daily.